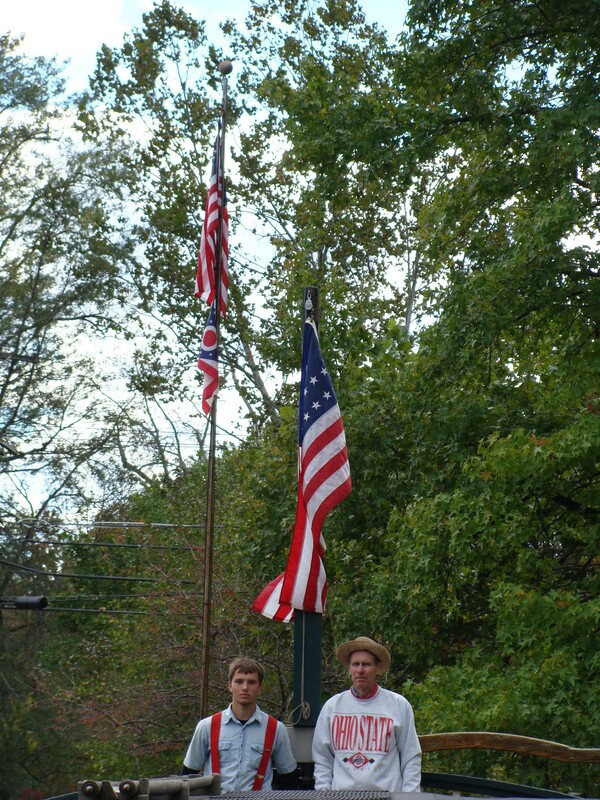 25 stars fly on the flag of the Monticello III canal boat. 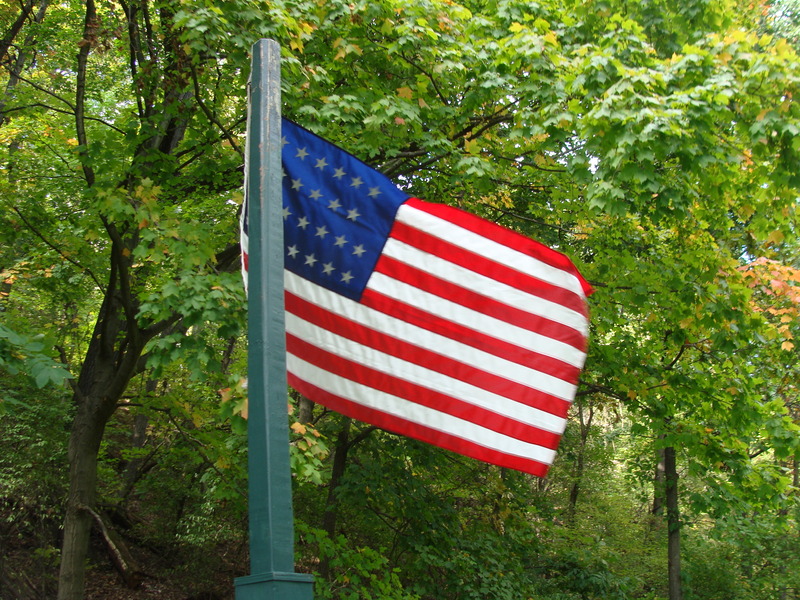 The official flag of the United States in 1836, she represents the early days of the Walhonding section of the canal in Coshocton County, Ohio. I wondered just how far back in time I was stepping when I rode the horse-drawn canal boat last Sunday. Tom Roahrig’s granddaughter Kimberlin is the ideal ambassador for the Monticello III Canal boat. She’s friendly, relatable and genuinely as interested in her family’s history with the canal as she is with the tourists coming through her store. I arrived late Sunday afternoon, having gone for a late brunch at Raven’s Glenn Winery and had fifteen minutes before the final launch at 3pm. 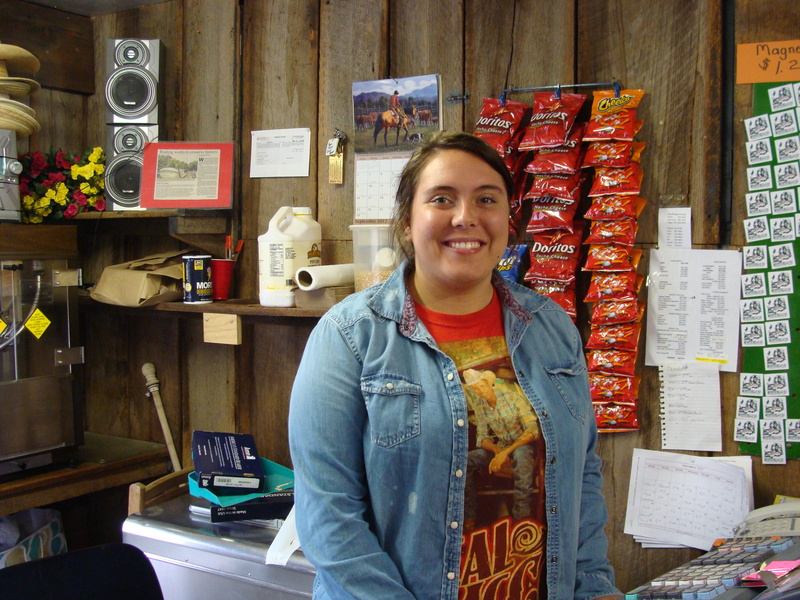 Greeting me in the general store (which serves as ticket office, gift shop and information center) was a sweet and knowledgeable young woman named Kimberlin. She is the granddaughter of Tom Roahrig, whose family has operated the canal for decades. Currently they lease the operation from Lake Park and care for it just as they did when it was in their family more than twenty years ago. 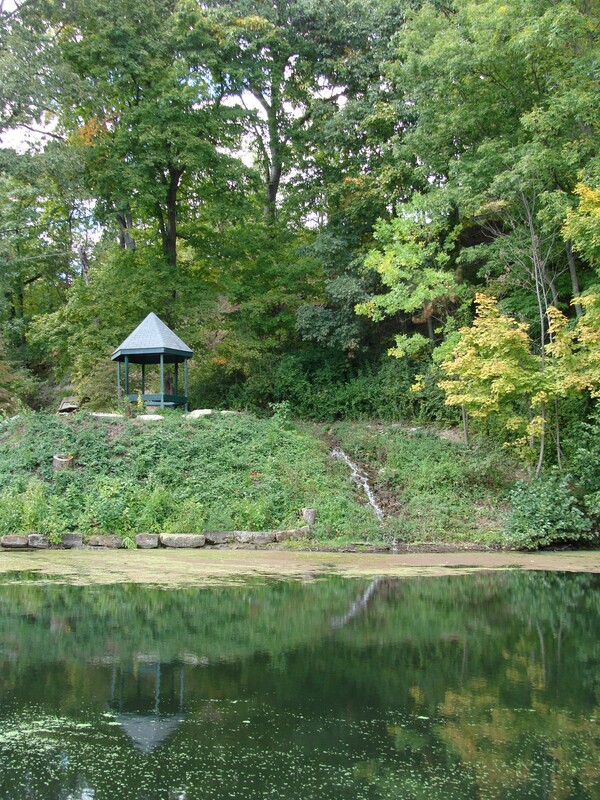 There are many sections of the original canal (which ran from Portsmith to Cleveland) throughout the historic Lake Park district, but this section was restored in 1971. 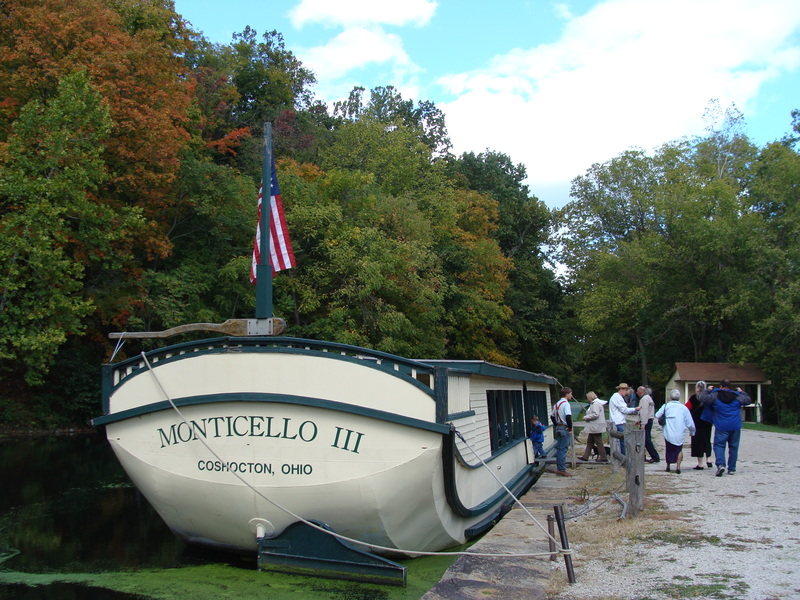 In 1830 the first boat named Monticello passed Roscoe Village, and it’s for this boat that the current Monticello is named. This replica was built for them using blueprints from the Ohio Historical Society by a townsman nicknamed “Mad” Marshall Jacobs. He was so-named, according to Captain Edward, because he was a daredevil, having a propensity for climbing. He even married his bride in a 1946 wedding atop a 176-foot flagpole, which garnered national attention and photos in LIFE magazine. The bank across from the canal boat dock and its reflection in the canal. The stories are what truly make the canal ride worth the 45 minute glide along the restored canal. The chronicles rotate and adapt, Captain Edward assured me, to meet the audience. I learned of a time when Russian tourists were aboard the boat and he reached into his encyclopedic memory bank and gave them a wonderful analogy about Milan (pronounced MEYE lan), Ohio, where waterways were the key to exporting wheat. Milan, he told them, was the second largest exporter of wheat in the world, falling only behind their own Odessa, Russia. Captain Edward cultivated this through reading and teaching for years in the Coshocton County schools. Combined with an engaging narrative and penchant for suspense, it’s what gives the Monticello III the kind of appeal that’s ideal for a tourist town. He caters his stories for the demographic on his boat, and takes time before and after to answer any questions. Toward the end of the ride, he even let a couple young passengers steer the boat. Edward Finlay is in his 22ndseason with the canal boat. Each season, he assured me, has seen tourists from six of the seven continents. (They would welcome an Antarctica contingent any time! 😉 ) He has witnessed many weddings. Even young Helmsman Kendall’s parents were married on the canal boat. Governors Voinovich and Taft are among the celebrity passengers having ridden the Monticello III during their tenures in office. They didn’t recall Gov. Kasich having yet ridden the boat, but with Kasich’s concern for Ohio economy, I can imagine he won’t let his term of office slip away without an opportunity to boost tourism through a series of appearances at key spots like this one. 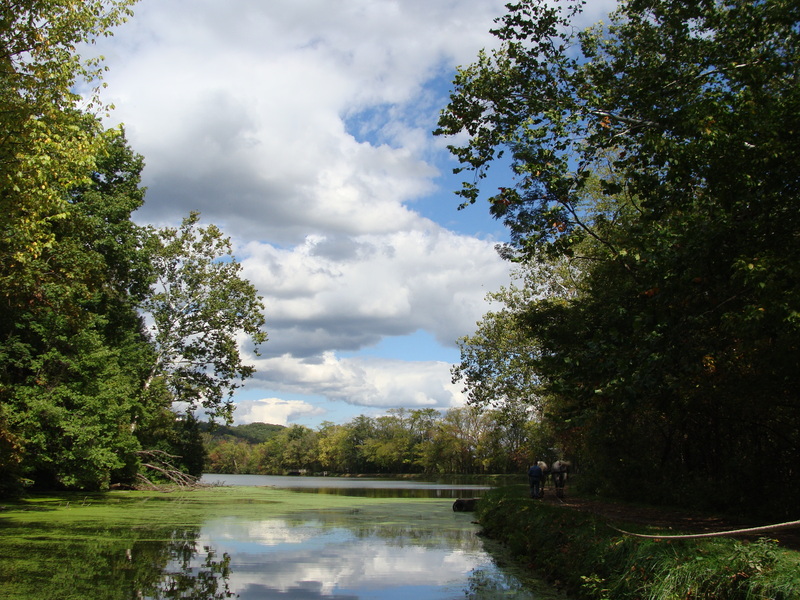 As we rode, watching Hoggee (pronounced hoagie, like the sandwich) Bill guide the horses along the trail, far ahead of the boat, Captain Edward set a scene of the Ohio and Erie canals in the early to mid 1800s. We imagined the crew section, the ladies section, the stable area where animals could be swapped out for the long journey. 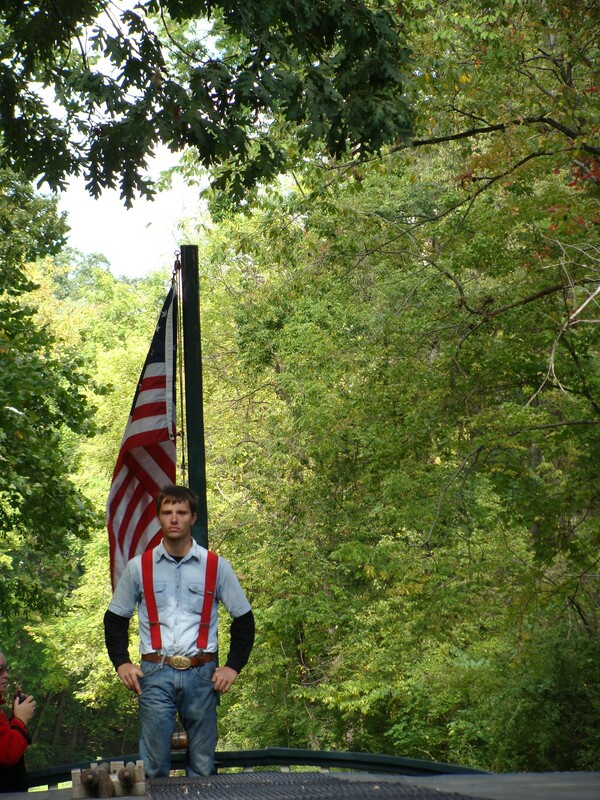 We imagined a time when young boys worked as hoggees, guiding mules, horses and oxen to pull the boats north and south. Four horses named Fred, Jasper, Rock and Bill switch out pulling the canal boat. They are guided here by Hoggee Bill. While the mules were use most often, horses have won over the hearts of modern passengers. 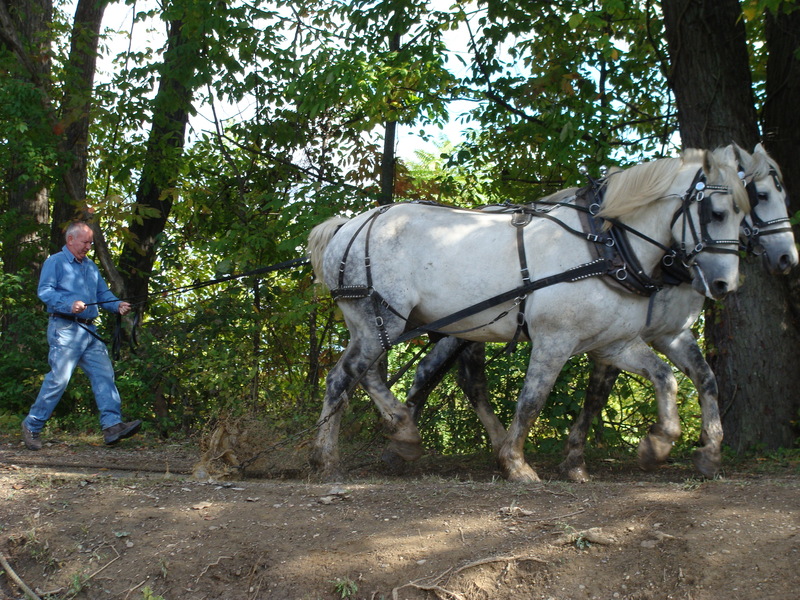 As famous as the canal boat itself, four Percheron draft horses—Fred, Rocky, Jasper and Bill—have their own celebrity status. Housed in the park stables, the beautiful and well-tempered mounts also participate in charity work with Higher Hopes Therapeutic Riding Center. Hard-working celebrities Fred, Jasper, Rock and Bill take a lot of money to maintain. I was happy to donate for their care and feeding using the donation jars in the general store. I would love to have an option to donate online as well. I won’t give all the spoilers to the great stories Captain Edward tells along this ride, but I promise you, some of it will shock, disgust and fascinate you. It’s an incredibly unique blend of occurrences on-board the boat, combined with stories of the fights for right-of-way between crews, when a northbound and southbound boat would meet. 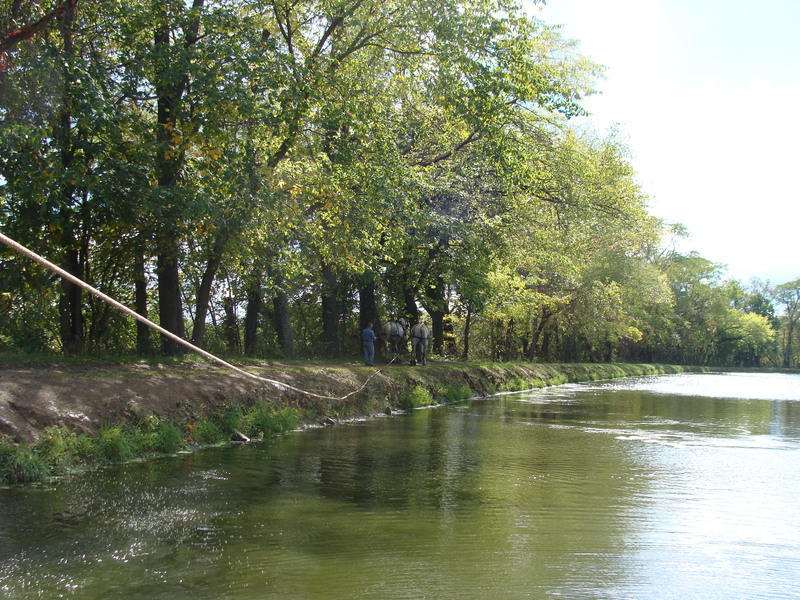 A canal boat is pulled by what’s called a tow rope, attached to a team of animals (originally mules, horses or oxen but now predominantly horses). The path the horses walk along is called, appropriately, the tow path. 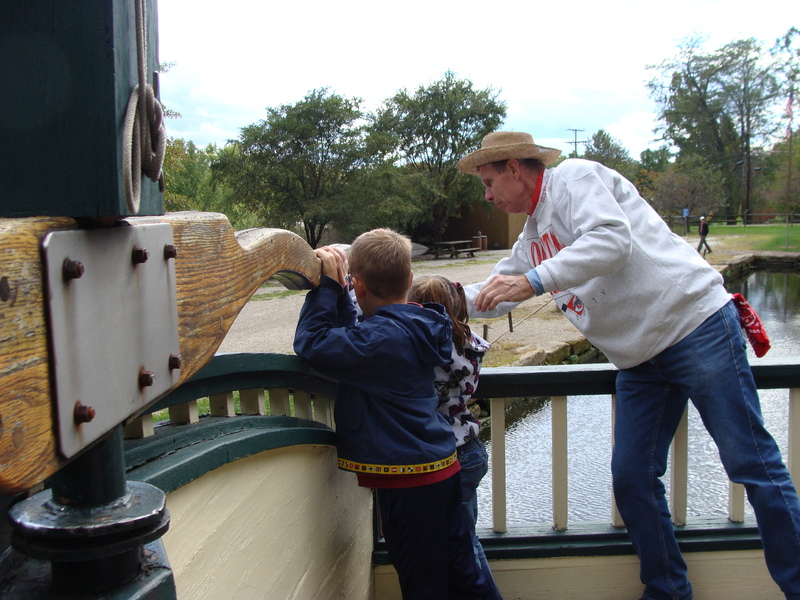 I’m already taken with Coshocton’s history and people and I’m so glad I began my adventures with the canal boat ride and Captain Edward’s lively history. I know I want to ride the canal boat again, although the season is already coming to a close for 2012. After hearing about a dinner cruise in the summer, and the frequent entertainment by a banjo playing passenger, Jerry Weaver, the Planner side of me began to kick in and I imagined a summer full of theme-driven cruises and events, complete with the captain adapting his trivia to the theme at hand, and the option of season passes for residents. Signs on the boat and at the launch for the Monticello III Canal Boat in Coshocton, Ohio. Of course, nothing can ever capture what it would have really been like in the mid-1830s (and I’m not sure with my current state of comfort and equality, I would survive it) but I can’t help being smitten with the nostalgia of a time before the “iron horse” (railroads) and the Ohio flood of 1913 ended the glory days of canal boat transportation. The boat ride only cost $8 and operates until mid-October, weather permitting. The season officially re-opens in May. Check their website for details. Thank you Kimberlin, Kendall, Bill and Edward for a great introduction to part of Coshocton’s history. I hope to see you again before we move on. Wow, that really sounded like a good time!! Thanks for the ride along! It was, and you’re welcome bro!